CoinSwitch is a tool that can be used to convert between currencies in a matter of minutes, using major exchanges without the need to have an account on each exchange. The platform aggregates prices and pairs from the leading exchanges, supporting more than 500 coins. One of the key points that this company has tackled is the ability to allow its users to access exchanges without needing to log in to said exchanges, this eliminates the need for long wait times to get an account KYC-verified whilst removing the hassle and possibility of receiving a higher price than the lowest available. 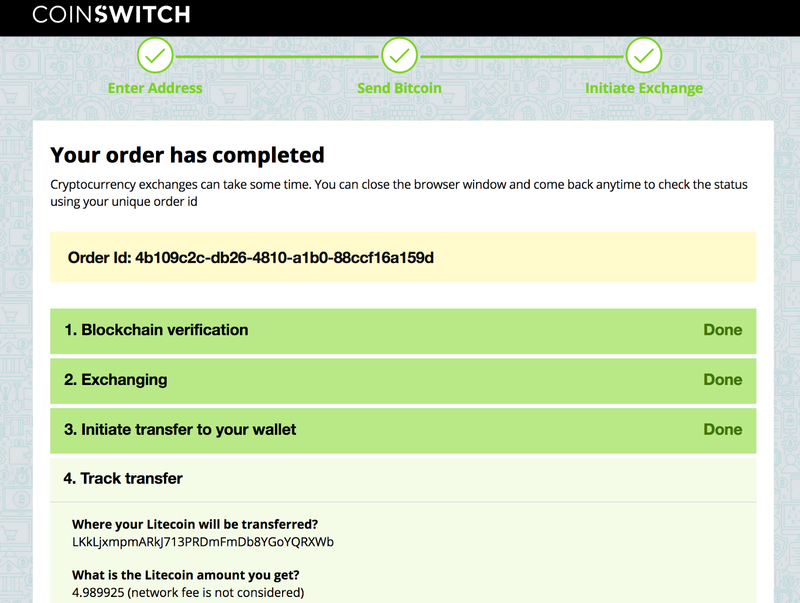 Based on our awesome experience with CoinSwitch, we have actually implemented their service directly into our backend, allowing you to trade with the best available prices for coins. CoinSwitch integrates with exchanges in order to allow their customers to trade between over 45,000 pairs. When on the site, people can select which two pairs they wish to trade between, this will then bring up a page where you can compare which exchange will result in the maximum gain. Leveraging their API connections and integrations with exchanges, they’re then able to process your request and purchase the amount that is desired on the exchange, before then transferring it to the address you provide. This process means that whilst they have to have some sort of access to an exchange, the end user, you, does not need any access to an exchange, apart from accessing CoinSwitch of course. To use the platform, you don’t even need an account on their site, you just need the funds that you are trading. How do you use CoinSwitch? 1. To get started using the platform, you must first navigate to their website. When first visiting the website, an instant price converter stands out at the top of the page. Here, we will select the coin that we have and the coin that we want, inputting the amount of the coin that we have. CoinSwitch will automatically take the value of the coin that we have and convert it into the coin that we want, presenting us with one of the best rates we can get. 2. When pressing view all offers, CoinSwitch displays all available offers from the exchanges that they use, recommending what is, usually, the one with the highest savings and displaying what those savings are. This is incredibly beneficial to users as it allows them to save more money instead of spending it without realizing. 3. When selecting which exchange to use for trading, prices will be constantly updating every 10 seconds, on the CoinSwitch site, to accommodate for the fluctuation in market prices, on each exchange. Some of the exchanges provided will offer a fixed rate for a certain period of time, the amount of time the rate is fixed for will be displayed. The address where you intend to receive the currency to will need to be inputted. 4. The next part of the process is sending the amount you wish to transfer, which in my case would be my BTC, to the address specified. CoinSwitch will automatically detect the deposit and move on to initiate the exchange. 5. The transfer will now commence and you will be sent your coins once the request has been processed with the exchange. As with all exchanges and the sending of cryptocurrencies, safety and security are always in the back of people’s minds. Trust is a big factor that is used to determine who people choose to trade with and send their money to - if someone can’t trust a service, why would they want to use it? The CoinSwitch platform has been built on the most trusted cryptocurrency exchanges, relying on them for its day to day operation, in order to convert one coin to another, communicating directly with an exchange to provide a user with their funds. The only way that funds could be lost is if the end user does not specify the correct addresses when making a trade. Failure to insert the correct address to receive money to could leave you high and dry, unable to do anything. Nothing can be done to recover funds sent to the wrong address - this applies to every single crypto transaction, not just ones with CoinSwitch. On a whole, the platform is rather safe and secure, there aren’t any issues that may put a user at jeopardy unless they fail to input the correct address. Is CoinSwitch Better than Changelly? Changelly is one of the most popular platforms for converting between coins without using an actual traditional exchange, or at least it was until CoinSwitch began gaining popularity. Both platforms support a large number of currencies, although Coinswitch supports over 500 coins which is significantly more than Changelly’s 130+ cryptocurrencies. Nevertheless, Changelly still supports the most popular to exchange pairs, such as ETH-BTC. Both platforms pride themselves in aiming and being able to offer the lowest rates possible, with CoinSwitch sometimes offering lower rates than Changelly. One of the striking differences between the two exchanges is that with Changelly you need to login whereas, with CoinSwitch, you do not need to log in, eliminating any form of an account completely. Both of the companies say that they will get the funds to you in under 30 minutes and are both rather trustworthy, security wise. 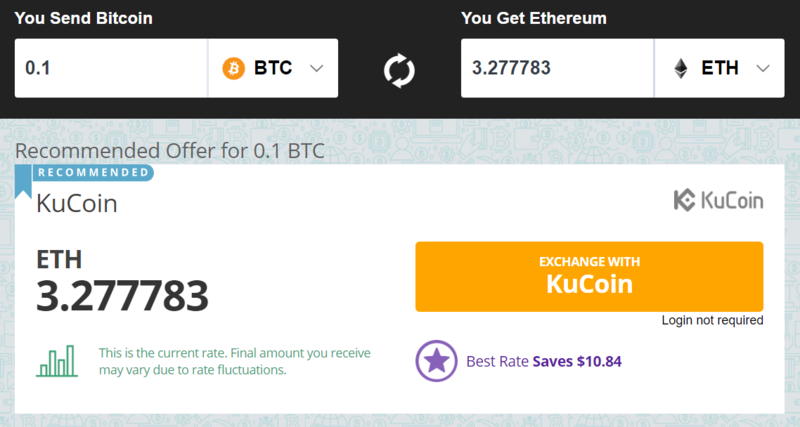 Changelly has stated on their site that they charge a solid fee of 0.5% that will go to themselves, with CoinSwitch slightly undercutting them by promising 0.49% as their maximum fee. It is important to note that these fees do not include fees on the exchanges that they are using, in addition to network fees. CoinSwitch is certainly the best platform to trade between coins on, without having to actually touch a traditional exchange yourself. The company offers some of the lowest fees and a wide range of exchanges, supporting over 45,000 different trading pairs in total. It is a no brainer to choose this platform over others, like Changelly, in order to receive the full benefits that it has to offer. CoinSwitch is a great choice for people who do not want to go through the hassle of using a traditional exchange and want an account-free way to trade currencies at the best prices. Need a hardware wallet? Take a look at our article on the top hardware wallets!